Helping two lovers elope might be romantic but it doesn’t pay the rent, and with Sheriff Gorman Truart instigating a clampdown on the City’s “unlawful”, Garrett can’t afford to be in debt. Fortunately, Rampone Dockside Shipping isn’t too far away, and with so many goods moving in and out it’s doubtful anybody will notice if a few items go astray. Stealing from dockside warehouses is hardly the most prestigious of activities, but it’s still better that picking pockets on the streets. As with the previous level, Running Interference, Shipping and Receiving serves partial duty as a tutorial. Normal difficulty still comes with a number of textual pop-ups explaining game mechanics, with one of your objectives actually requiring that you reach the office on the top floor of Building A. The locking system for the bays that constitute the majority of the building can be found here, making it an important destination for any out-of-hours visit, even if on the higher difficulty settings it is not mandatory. In many later levels, there will be locations that are either necessary for progression, or that provide substantial benefits, that are not listed as objectives – making exploration an implicit requirement. 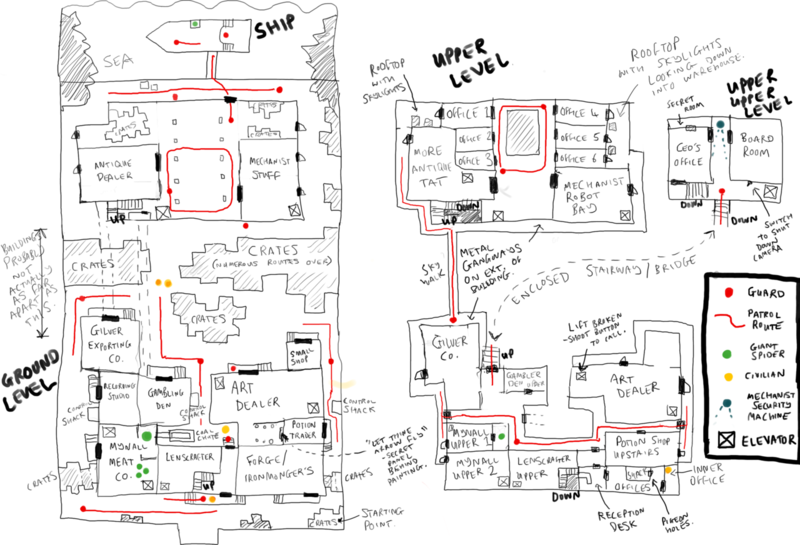 Unlike Running Interference, which took place entirely within the confines of a single manor house – the critical path through which was described by a red line on your map – Shipping and Receiving drops Garrett in at the deep end: a sprawling complex of buildings and courtyards patrolled by guards and wandering civilians. Garrett begins on a stack of crates in one corner, and it is to here that he will need to return once his activities for the night have been completed. Other than that, the way forward is up to you. Found in the first floor office, these pigeon-holes contain a number of correspondences between the Rampone's and their tenants. The different messages all serve as contextual scene setting while also providing useful clues as to which bays might contain the best loot. A certain Lucky Selentura and his overdue rent is the Rampone's current concern, musings on his fate a recurring theme. The central plot of The Metal Age has yet to begin, but throughout Shipping and Receiving a number of conversations can be overheard that set up elements of what is to come – from the lone Hammerite lamenting the decline of his order, to the two civilians (and likely Spice addicts) discussing the lack of trees in the City in recent months. Combined with these little moments of foreshadowing, the different storage bays in Building A – from an art gallery, to an illegal gambling den – serve as a microcosm of The City as it stands circa The Metal Age. Specifically, these moments reveal how the different elements of the City’s lower classes are dealing with life after the rise and defeat of the Trickster. The Pagans might be gone, but they took a lot of the Hammerites with them, leaving a power vacuum ripe to be filled by the growing presence of the Mechanists. Though none actually make a physical appearance until the next level, the Mechanist’s influence, especially among the less salubrious of the City’s residents, is already growing. While the richer areas might still cling to the past and the ways of the Hammerites, the once-heretic sect are building their powerbase – not necessarily in secret, but certain not entirely openly. Walled off from the rest of the Wayside district, Rampone Dockside Shipping consists of two separate but connected buildings. The majority of space in Building A is taken up by the ten bays of varying sizes, each of which has been rented out as storage, workspace, or for a range of other not entirely legitimate uses. Building B houses the majority of the administration offices, along with four larger bays used originally for the storage of transshipped goods, but which have now been rented out in their entirety to the Mechanists for a considerable fee. The contents of the bays inside Building A provide the majority of Garrett’s loot. Unfortunately, they are all locked and can only be opened one at a time. In the first floor office of Building A, and in a number of wooden sheds throughout the grounds, are terminals for the key pad-operated mechanism that can be used to unlock each of the bays. Any of the bays can be unlocked from any of the terminals, but as only a single bay can be unlocked at a time, access to all of them will require either returning to the same terminal multiple times, or locating one of the others throughout the level. Even if you choose to only ever use the terminal nearest the bay you are opening, an amount of enforced backtracking will be required. A variety of useful items can be found within the crates stacked in the courtyard of Building A. With the exception of the office on the first floor – and a curiously empty room at the top of the stairs on the second floor – the space inside Building A that isn’t given over to the bays themselves consists of a network of short corridors linking the interior doors of those bays that are large enough to warrant a second storey with the office itself. Heavily patrolled, and with little in the way of hiding places, moving through these corridors can prove challenging. Lit from above by sky lights, the supporting roof beams cast a grid of shadows across the floor. Garrett can remain hidden by standing under the beams but doing so will put him directly in the patrol route of one of the guards, with a patch of illuminated corridor between him and the next rectangle of darkness. Though you will be able to hear any guards coming from some distance, the number of them patrolling these corridors, combined with the limited sight lines offered by the multiple intersections, make it difficult to keep track of specific individuals. With few corners dark enough to provide absolute concealment, it is better to keep moving than try and find somewhere to wait out the patrols. Fortunately, if you can reach it, a rubbish chute allows for a quick exit to the more open environment of the exterior courtyard. These cramped corridors are in marked contrast to the layout of space in Building B and the surrounding areas where long sight lines and wider paths serve to promote intentional movement over the improvisational needs of trying to avoid Building A’s interior guards. Levels in The Metal Age are made up of differing degrees of these two types of spatial arrangement: open areas that encourage proactive play by allowing the path ahead to be observed before initiating action, and more compact spaces that require a reactive approach as threats are often invisible until you are all but on top of them. Thanks to Mapstalgia for this overview of Rampone Dockside Shipping, drawn from memory. Though there are only the barest visible indicators of it, Rampone Dockside Shipping is made up of three separate but overlapping zones of influence, each with a different approach to the arrangement of space, and each of which requires a unique key in order to gain full access to the area and its secrets. The first of these zones is centred about Building A and the storage bays within. Its key is not vital, but its ability to unlock the interior doors of each of the storage bays means it is highly useful as a means of opening up new paths through this zone. Continuing on toward the administrative offices, you enter the second zone, the focus of which is Building B and specifically those offices on the first floor. The key for Building B performs a similar function, granting direct access from the interior of Building B to the dockside itself; like the Building A key, it can be found on one of the guards on patrol within this zone. 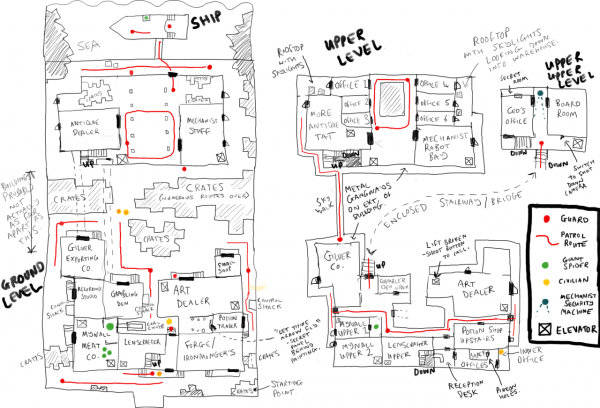 The final zone overlaps the second, extending from the ship in the dock to encompass the warehouse space on the ground floor of Building B. Davidson’s Key, found on one of the patrolling pirates in Building B, is necessary in order to complete the Expert objectives. It opens the locked crates that contain the required bags of Spice, and also grants access to the various chests found aboard Davidson’s ship. Despite some of the Rampone’s concerns over the potential illegal gambling taking place in Building A, the pirate Captain Davidson clearly has a lot of influence over the events occurring within Building B. As is befitting a pirate Captain, Davidson is not exactly a trusting soul; four of the thirteen secrets on this level can be found aboard his ship. There is also a dead body stowed in one of the large boxes in the hold. The unfortunate, and unfortunately named, Lucky Selentura perhaps? Running around the side of both buildings and crossing over the courtyard between the metal catwalks provides a rapid means of movement across the level, but at great expense. It’s all but impossible to completely eliminate the noise of your footsteps, and with the guards patrolling on them, and on the ground below, using the catwalks for extended periods will almost certainly bring unwanted attention. In emergencies, they can be useful, but are often more trouble than they are worth. There is never anything to prevent you venturing this far into Rampone Dockside Shipping, though it is only when playing on Expert that exploration of Building B and Davidson’s ship is a requirement. Hidden throughout Davidson’s zone of influence are a number of bags of the illicit substance referred to simply as Spice. A number of these Spice bags can be found aboard Davidson’s ship, but the majority are in locked crates within the ground floor storage area. Accessible from the offices on the first floor is a flat roof which extends over the wings of Building B; a series of skylights provide illumination for the storage area within. Beneath each skylight is a stack of crates, and hidden amongst them are those containing the Spice. Smashing the skylights will allow you to drop onto the crates from above, but this is hardly the most subtle approach. A better method requires paying attention to your surroundings, and delving into Garrett’s bag of tricks. Unlike Running Interference, at the start of this level you will have been offered the opportunity to purchase additional equipment. Neither these items, nor the funds to purchase them, carry over into subsequent missions (With a couple of exceptions we’ll cover as this series continues) so it is worth spending as much as you can and using whatever equipment you feel is appropriate. Some of the more useful items that Garrett can use are not available for purchase at this stage and will need to be recovered from within the level. When it comes to recovering the Spice, that means locating the Rope Arrow hidden within a stack of crates in the courtyard outside Building A; another can be found within one of the stacks of crates, but reaching it requires using a Rope Arrow or breaking the window, and since Rope Arrows can be recovered when used, having multiple arrows is not as beneficial as it may seem. Despite protestations to the contrary, the Rampones are not exactly legitimate businessmen. Davidson's pirate ship is worth exploring as the Captain likes to keep his valuables close. Rampone Dockside Shipping is an industrial revolution era warehouse patrolled by pirates and sword wielding guards. A change from the residential and historical areas of the City that were common throughout The Dark Project, this modified aesthetic feels like a mission statement for the world of Thief circa The Metal Age. The Mechanists are coming, and their ascent will change life in The City for everybody. There is little of the Pagans to be found anymore, and it seem hardly coincidental that the few traces there are to see in Shipping and Receiving – the unnaturally oversized spiders – are locked away; and in once instance, even being used as a cheap source of meat by that less-than-upstanding citizen Sven Mynell. The first appearance of a Mechanist Face, guarding President Rampone's office. Easily the most sophisticated security device in the entire complex its placement is a telling indication of the naivety of the Rampones. The area it guards contains little that is truly valuable. That the control panel for it is positioned barely feet away is a further indication of the lack of understanding the City's citizens have for Mechanist's devices. After Running Interference, Shipping and Receiving feels like you’ve been dropped in the deep end. The level immediately feels larger than the one that proceeded it, though it is not as sprawling as it first appears and certainly not as large as some of the levels to come. The lack of a specific path, and some required backtracking, mean the level can take longer to complete than those of a similar size, reinforcing the perceived sense that Rampone Dockside Shipping is a sprawling complex. Throughout Shipping and Receiving are little narrative beats that foreshadow events yet to come, from the guards discussing a Mechanist Tower (the name of which will only much later be revealed to be Angelwatch) to the dearth of trees in the City, to the disassembled Mechanist machines inside crates in Building B. Each of these serve to contextualise the world of Thief, but are not essential to an understand of the central plot. Playing on Expert, with its additional requirements, means that more of these embedded narrative elements are likely to be found simply because more of the level will need to be explored. Together with the additional objectives themselves, this almost serves to make the selection of the difficulty a means of self-selecting how invested you want to be in the world of Thief. Each additional objective provides a broader context for the level itself and the motivations of the people within it, making difficulty selection a more than simply functional decision. The first of our fifteen-part series of articles examining Thief II's level and mission design begins with Garrett lending sympathetic hand to an old friend in "Running Interference". 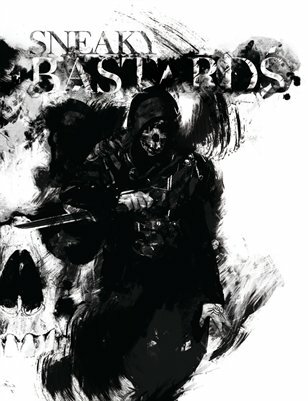 The second last chapter of the Thief reboot returns to locations and lore from the original trilogy. Garrett returns to Northcrest Manor in a Thief mission that shows glimmers of good spatial design. I was afraid that this series wasn’t going to be continuing. Glad to see what I’ve been proven wrong. You nailed it by saying that this level is like being dropped in the deep end; the first level teaches you about the assorted mechanics of the game, but this one exists for the player to discover how put them to use. The schedule is a little all over the place I’m afraid, the larger the level the more there is to say and the longer the article takes to write so going forward they are liable to get longer and be further apart. I’m sorry about that. If you have any ideas for other games I can take a similar approach with once I do finish let me know, I’m contemplating Dishonored but we’ll have to see how that turns out. Never even found the ship when I played this level. I should really replay this game sometime, probably on Hard or Expert. Rather liking this series. Keep it up. I always have fond memories of this level. Especially when on the roof looking down into the administration of building A. A really cool thief 2 moment. By the time I got to the ship everyone was knocked unconscious. The levels are always a bit boring once that’s happened. Maybe I need to leave more patrolling guards in the future! Keep up the cool series! and BRING on thief 4! Another superb article. As a long-time Thief fan, I’m delighted to see you’ve continued with the series and am particularly enjoying your focus on narrative structure and the way level design complements the gradually-unfolding plot. Considering I have a big-box edition of this and Thief Gold (which should date me) it’s great to see some interesting new aspects I’d not previously considered. Great work and keep it up! I’m fine with you taking as much time as you need to write your articles and I’d like to see more of this series. The writing cuts past the navel-gazing that is so prevalent on many sites and straight to the point, while remaining detailed and insightful throughout. Anyway, looking forward to the Stealthjam! Since I’m not a developer, I’d be content in seeing what comes out of it. Any chance of coverage regarding what goes on? Absolutely one of my favorite levels of all time. A totally immersive level and one feels the need to rush, but if that happens, one is compelled to return to the boxes, crates, stairwells, rooms that require thought before attempting to locate them. I have played this level many times for the intricacy and suspense for what may be lurking around the next corner. Now I play it for fun every so often for fun. I spent a great deal of time to discover what might be on the shelf far above one of the staircases going up to the next floor to continue the game. Access requires thought planning and judicious usage of tour arsenal. No secrets will be revealed here. I rate this level a 10 for pure enjoyment, in every sense of the word. I would also ask that the developer continue, please. This is another great article, thank you very much!